Rail services on the western standard gauge line between Melbourne and Adelaide were interrupted on Saturday morning when a train was forced to stop in Horsham due to debris having been placed across the line. The obstruction was reported to be a cement 'bollard' and although it did not cause significant damage to the train, it did result in the Hazel Street level crossing just off Dimboola Road being blocked to road traffic until the train was able to continue. It was also later reported that a number of containers towards the back of the train were broken into while the train sat stationary in Horsham yard and items stolen. It is still to be established if these two incidents are related. At the time of the first train was halted there were a number of others on the move in the area that were forced to stop and wait the line to be cleared. Both 7MP7, with NR28 and NR30 up front, and 6MP9, hauled by SCT003-SCT015-SCT008, were held at Murtoa Loop, whilst it was 6MP5 with NR20-NR22-NR119 which was the train that was initially held up. The delay was exacerbated by train crews running out of driving time and having to wait for relief crews to arrive. A Qube grain service had already passed through Horsham before the delay and was able to continue onto Dimboola where it was loaded at the Grainflow Centre without any delay. By 12.25 6MP5 had been moved 22 kilometres north and side-tracked at Pimpinio Loop and the other trains were on the move. Above - 6MP5, operated by Pacific National, sitting in Pimpinio Loop waiting for a number of following trains to overtake. - WVRG Photo. 6MP9 was sighted through Dahlen, north of Horsham at 12.38 and Great Southern Railway's Overland passenger service was only sixteen minutes late when it departed Horsham at 12.47 behind NR32. 6MP5 departed Pimpinio Loop at 13.52. 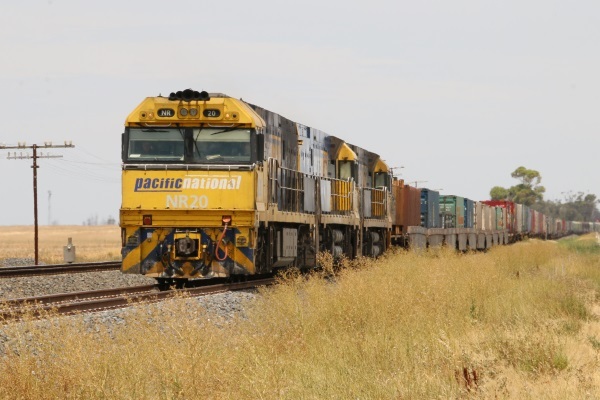 Once this westbound progression of trains had cleared Dimboola Loop, the Qube grain service hauled by CM3313 and CM3315 departed for Portland at 14.20. By 16.00 PM6 with NR8 and NR24 up front was sighted idling in number two road at Dimboola Loop where it was overtaken by an up Pacific National grain train from either Nhill or Lillimur with BL31 and 8168 as the motive power. BL27 and BL30 were also present in Dimboola yard during the day on the front of a rake of empty grain hoppers.